To open a dealership and sell vehicles to the public or to other dealers in Florida, you must get a license from the Department of Highway Safety and Motor Vehicles (DHSMV). This requirement applies equally to everyone who wants to sell vehicles three or more vehicles during a year. To get licensed, you need to comply with a number of both pre-licensing and licensing requirements. This includes getting a tax number but also completing a dealer training program, and posting an auto dealer bond. 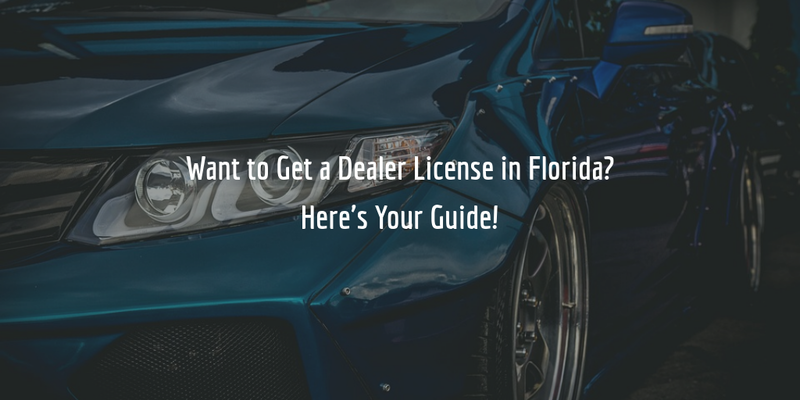 If you want to get a Florida dealer license, our guide will guide you through the process. Keep reading! The licensing process happens in two main stages – first, you must comply with the pre-licensing requirements, after which you must take care of licensing requirements and complete and submit your application. Prior to working on your license application, you will be required to complete the following pre-licensing requirements. It is recommended that you do not sign a lease before you have an approval from a from a Division of Motorist Services Compliance Examiner. Moreover, your location must comply with the requirements of the Florida Administrative Code 15C-7.003. These include both conditions for your office space as well as your display space, along with conditions for how you must conduct operations. To function as a business in the state, you need to obtain a registration from the Division of Corporations at the Office of the Secretary of State. This applies in particular to corporations, LLCs, and LLPs. If you will be operating under a fictitious name, you must also get a registration from the Division. You must pass a training class provided by a DHSMV-approved dealer training school. You will need a Federal Employee Identification Number from the Internal Revenue Service. You need to get a sales tax number from the Florida Department of Revenue as all sales, unless exempt, are taxable under state law. Obtain fingerprinting for all officers from a service provider approved by the Florida Department of Law Enforcement (FDLE). Applicants for a dealer license must obtain a garage liability insurance with at least $25,000 combined single-limit liability coverage, including bodily injury and property damage protection, and $10,000 personal injury protection. Alternatively, excluding franchise dealers (VF), these applicants may also get a general liability insurance policy coupled with a business automobile policy at the same types and amounts of coverage as specified above. Once you’ve made sure you’re compliant with all of the above requirements and have gathered all the necessary documents, you are ready to submit your application. To complete the application process, you must submit your application to the DHSMV. At the time, you will also need to pay a $300 fee to the Department. If everything is submitted correctly, you can expect your license to be issued and mailed to you within a month’s time. Licenses for franchise dealers must be renewed by renewed yearly by December 31. Licenses for independent, wholesale, and auction dealers must be renewed annually by April 30. To start your renewal, complete the renewal application and see the additional renewal requirements in the checklist included in the form. Dealers in Florida require a $25,000 surety bond as a guarantee that they will comply with Title XXIII, Chapter 319 and 320 of the Florida Statutes. The bond also serves as protection to the state and public if a dealer violates the statutes and causes losses or damages to anyone as a result of such a violation. To get bonded, dealers need to pay a bond premium which is equal to a fraction of the full amount of the bond. The exact fraction, or rate, which you need to pay is determined by the surety when you apply, on the basis of your personal credit score. You can get an estimate of the cost of your surety bond through our bond cost calculator below. Do you have any questions about this bond and the bonding requirements for dealers in Florida? Get in touch with us at 866.450.3412 or contact us here.